Have you ever noticed that the nicer the home, the better the cabinets? Custom cabinets are the hallmark of a gorgeous, thought-out space, which is why you might be thinking of adding them to your kitchen, bathroom, laundry area, or storage space. Unfortunately, some homeowners make mistakes that leave them with buyer’s remorse later. Read on to learn about three mistakes to avoid when choosing custom cabinets, as well as what you can do to prevent issues during the ordering process. Since big-box stores are filled with pre-made cabinets and you can order RTA cabinets online, you might be tempted to overlook quality in favor of convenience. Unfortunately, although many cheaper cabinet varieties are designed to mimic the appearance of natural, long-lasting materials like hardwood, they aren’t made to last, leaving you with an even bigger project down the road. To prevent installing something that might only last a few years, make quality a priority as you shop for new cabinets. Talk with cabinet makers about the kinds of materials they use in their cabinets, and avoid any business that uses inexpensive particle board in the construction of their boxes. Since particle board is made up of wood aggregates held together with a binder, they can eventually crack and break, causing serious structural issues. In fact, over time, cabinets made of particle board can lose their ability to support the weight of things like plates and kitchen appliances, creating a long list of potentially dangerous situations. Instead, look for cabinets made entirely of real wood, and look for the hallmarks of great wood construction, including dovetailed drawers and pegged joinery. Additionally, talk with cabinet makers about the finishes they use and whether they will yellow or lose their sheen over time. You might adore the look of navy blue cabinets and gold hardware, but if you decide to sell your home in the future, you might be left with buyers that are more than a little confused about your design choices. Oftentimes, over-personalizing a space is more damaging than leaving a home un-renovated in the first place, since anyone purchasing your home in the future might need to completely remodel the kitchen or bath you upgraded in the first place. When you choose cabinetry and hardware, think about the future. Make classic design choices that will meld with future décor changes, such as shaker cabinets with a natural finish. When you choose hardware, look for versions that don’t require you to make several holes, as this will help you to protect the structural integrity and appearance of the cabinets. Additionally, fewer holes with standard width requirements make it easier to change hardware down the road. Oftentimes, homeowners who are worried about preserving floor space or adding another window are tempted to overlook the need for upper cabinets or additional storage areas, destroying their ability to keep their home clean and organized. Before you shop for new cabinets, think carefully about the amount of storage space you need, and work with your contractors to ensure that you have places to put things. To take the guesswork out of storage requirements, go through your cabinets and make a list of everything you are currently storing. Don’t forget about things you might be storing in other parts of the home so that when your renovation is finished, you have a convenient place for everything. 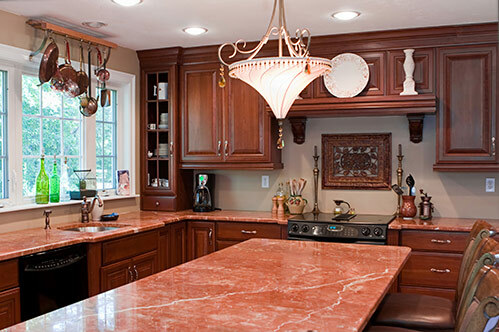 Whether you are thinking about designing the custom kitchen of your dreams or your master bathroom needs a few updates, the professionals at Huntsville American Cabinets can help. With a commitment to using only the finest woodworking practices and the highest quality natural wood, these cabinet experts understand what it takes to complete a project the right way the first time around.